The most common postoperative complications following cardiac surgery are low cardiac output, postoperative bleeding, cardiac tamponade, atrial dysrhythmias, ventricular arrhythmias, renal dysfunction, wound infection and myocardial infarction. With improving surgical techniques — and especially the introduction of cold potassium cardioplegia —postoperative low cardiac output is now uncommon in most centers. Patients judged by examination or by direct cardiac output determination (eg, cardiac index 2 L/min/m2) to have inadequate perfusion must be treated aggressively. Therapeutic options can be categorized as alterations in preload (volume administration), inotropy (dopamine, dobutamine, etc), and afterload (vasoconstrictors, vasodilators). Inadequate heart rate can be treated with epicardial dual-chamber pacing. The most common problem is hypovolemia; volume replacement is usually accomplished with colloid solutions (blood, albumin, hetastarch), and it is not usually necessary to keep the hematocrit over 25%. Central venous pressures or pulmonary capillary wedge pressures of 15 mm Hg usually reflect adequate volume resuscitation. Additional inotropic agents may be added if low cardiac output persists. These include epinephrine, calcium, and phosphodiesterase inhibitors (milrinone). The latter are particularly useful in situations of high pulmonary artery pressures or systemic vascular resistance. Cases of refractory low output may benefit from intra-aortic balloon counterpulsation. A small catheter is inserted into the proximal descending aorta and helium is used to inflate a balloon on the catheter after aortic valve closure, thus augmenting coronary filling. The balloon is deflated with systole, resulting in afterload reduction. 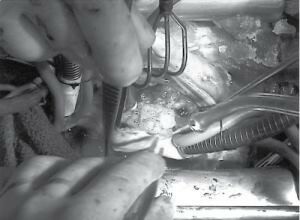 In extreme situations, operative placement of ventricular assist devices may be indicated. Cardiopulmonary bypass results in a number of hemostatic perturbations that may affect the clotting process. Residual heparin from the procedure or preoperative anticoagulants, thrombocytopenia, and altered platelet function are the most common problems. Activation of fibrinolysis and dilution of clotting factors also contribute. Most of these problems can be addressed intraoperatively. Administration of antifibrinolytics such as lysine analogs (aminocaproic acid) or serine protease inhibitors (aprotinin) during cardiopulmonary bypass has been shown to reduce postoperative bleeding in complicated patients. Criteria for excessive bleeding after open heart procedures vary widely. However, mediastinal tube outputs greater than 100 mL/h for more than 3 hours postoperatively is of concern. Prompt reexploration of the patient is always preferable to multiple blood transfusions and does not increase wound complication rates. Cardiac tamponade can be a postoperative surgical emergency. The characteristic hemodynamic finding is elevated and equalized central venous, pulmonary wedge pressures, usually in the setting of excessive mediastinal bleeding. Low cardiac output is a sine qua non of tamponade. The urine output is low, and metabolic acidosis may be present. The chest radiograph may demonstrate mediastinal widening or blood collection. Echocardiography may be helpful in confusing cases, but if a significant question of tamponade exists, reoperation should be considered. Atrial dysrhythmias are common following coronary revascularization. Rapid atrial pacing may be useful in converting atrial flutter. For refractory atrial fibrillation (continuing more than 48 hours after good drug therapy) or in patient with unstable signs (hypotension, ischemia), electrical cardioversion should be performed. Transesophageal echocardiography to rule out atrial thrombus has been recommended prior to cardioversion. Ventricular irritability manifested by frequent or multifocal premature ventricular contractions is managed by intravenous lidocaine, procainamide, or amiodarone together with direct-current cardioversion when necessary. Short periods of closed-chest cardiac massage may be necessary, but early cardioversion should be emphasized. Polymorphic ventricular tachycardia are usually manifestations of significant myocardial ischemia, and problems with the quality of coronary revascularization should be considered. Significant hypokalemia, hypomagnesemia, and hypoxemia should be ruled out. Beta-blocking agents, oral procainamide, or amiodarone can be used for long-term management of persistent ventricular ectopy. Frequent unifocal premature ventricular contractions do not require therapy. Postoperative conduction disturbances occur frequently. Right bundle branch block is the problem and is usually benign. Transient heart block is seen more often after valvular surgery. After 5 days of persistent complete heart block, a permanent pacemaker should be considered. Postoperative renal dysfunction after heart surgery occurs in 1–5% of patients and is usually related to preoperative age, diabetic status, and renal insufficiency. The duration of cardiopulmonary bypass may also contribute to this complication. Manifestations may vary from transient oliguric tubular necrosis to permanent renal failure. Proposed mechanisms include perioperative hypotension, atheroembolism, sepsis, or administration of nephrotoxic drugs. Therapy for renal dysfunction consists of maintaining a higher arterial perfusion pressure, low-dose intravenous dopamine infusion, adequate free water hydration, and general support of cardiac output. Fluid balance and potassium intake are monitored carefully to prevent overhydration or hyperkalemia. Forced diuresis with furosemide or mannitol may reduce the severity of renal failure. Some patients may require temporary venovenous ultrafiltration or hemodialysis. Sternal wound infection should occur in less than 1% patients after cardiac surgery. Developing sternal instability, fever, leukocytosis, and wound drainage suggest the diagnosis. Severity varies from a superficial subcutaneous infection with a stable sternum to an isolated sternal infection with no mediastinal involvement to full-blown septic mediastinitis. At the first suspicion of a major wound infection, broad-spectrum antibiotics should be instituted and blood cultures obtained. The combination of diabetes and bilateral internal mammary artery harvesting predispose some patients to sternal infection. Infections producing sternal disruption should be treated with early wound debridement and pectoral or omental pedicle flaps. The mortality rate using this approach has been reduced to 10%, though morbidity remains high. With improvements in myocardial protection, perioperative myocardial infarction should occur in only 1% of patients. Inadequate myocardial protection, incomplete revascularization, and early graft closure are the most common causes. Symptoms are often unreliable, since many patients cannot distinguish incisional pain from angina. Classic electrocardiographic changes and elevated serum troponin or CK are needed for diagnosis. Judicious anti-ischemia therapy is appropriate, and patients with possible vasospasm of arterial grafts should be treated with calcium-channel blockers. Rarely, angioplasty may be used to treat acute graft closure.